Graphene-based optical switches are one of the promising building blocks for future optical integrated circuits. For the first time in this paper, a novel all-optical graphene-based cross-bar switch is proposed. The structure is based on our recently reported suspended graphene plasmonic coupler. The high carrier mobility of the suspended graphene layer results in long propagation lengths of surface plasmon polaritons that are essential for realizing cross-bar optical switching. 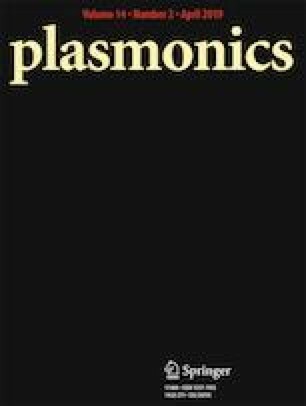 Dispersion relations of surface plasmon polaritons of a simple suspended graphene-based structure are derived in the nonlinear state. The relations are employed to analyze the device using the effective index method (EIM) that reduces the time and memory requirements, significantly. The switching length at the wavelength of 10 μm is as short as 2.6 μm. The required optical pump intensity is calculated as approximately 77 MW/cm2. The switching operation of the structure is investigated using the finite-difference time-domain method. According to the presented results, extinction ratios of as high as 11.18 and 11.1 dB are obtained at the bar and cross output ports, respectively. A wide spectral width of more than 1 μm is also calculated. Finally, the transient response of the structure is investigated and the switching time of less than 3 ps is predictable.